This week we began to put the nails in the coffin of Roman civilization in the West. We looked at the emperor Julian the Apostate and thought about the purpose of the study of history. One would think that a leader who loved history, read extensively in history, and believed in learning from history would serve Rome well. In fact, Julian had a disastrous reign and it was his use of history that brought his reign to a swift end (361-63 A.D.). He fought Persia instead of those crossing the Northern frontier and dealing with the pressing problem of the northern barbarians. Fighting Persia meant he could follow in the footsteps of Achilles and Alexander, and replay the whole grand epic of East v. West, as well as avenge the death of Crassus and Rome’s defeat at Carrhae in 53 B.C. To inspire his men he burned his supply ships, just like Agathon of Sicily and Alexander. But he did so apparently without realizing that those previous armies marched into fertile areas and could supply themselves from the surrounding terrain, whereas he marched into semi-arid terrain with scant supplies. He modeled his seige of a city off of Scipio’s successful seige of Carthage, without taking into account the different design of each city, specifically the fact that his army would be more exposed than that of Scipio’s back in 146 B.C. We refer to him as “The Apostate” because though he was raised as a Christian, he wanted Rome to return to its pagan beliefs, and he himself abandoned Christianity for paganism — again finding his anchor entirely in the past. Julian had intelligence and ruled conscientiously. He did not live extravagantly. He was not cruel, erratic, or selfish. He had a genuine devotion to Rome and believed in the idea of Roman civilization. But he suffered from some of the same defects that plagued his contemporaries. For him, progress for Rome could only mean a return to the past. He had competent administrative capability, but he had no clear vision or purpose with what to do with that ability. As one student said last year, when all you think of is the past, it shows you don’t think much of the future. In this respect, Julian simply followed in the footsteps of emperors like Diocletian, who we looked at last week. He too could only think of the past when he conceived of Rome’s future. Rome continued along the same path in a different guise. It seems that Julian could not synthesize and apply information — he could not think at the rhetoric stage of learning. Like Rome, he too was stuck in the grammar stage. His death on a foolish campaign into Persia seems emblematic of Rome’s demise. Rome had been declining in many ways from the years 180-350 A.D., and one of the problems they faced was their thinning population. This could be managed if Rome pulled back from its borders and closed ranks. But Rome could not face that. To pull back would admit that the emperor had no clothes. Rome decided to try and solve the problem by integrating barbarian soldiers into Rome. Maybe the old Roman magic would reassert itself. Barbarians would be acclimated to Rome and serve them loyally. It had worked that way in the past. But that was when Rome was healthy. Now there was little to attract them to Rome. What ended up happening was simply that they armed and trained barbarian war lords, who would not need much provocation to turn against them. Rome’s defeat at Adrianople in 378 B.C., and the sack of Rome by Alaric in 410 AD, can be directly related to this. In 476 Rome ends with a whimper, as no Roman is even able to be emperor. The title goes to the barbarian Odoacer, and Rome as we know is no more. I include below a missive of Julian the Apostate’s thoughts on how to revive paganism in Rome. If you read, you will see that Julian was no fool. He saw that Christianity had greater vitality than paganism, and his observations can apply to any age. The mistake he makes of assuming that all religions share a common morality at the center, with rites, ceremonies differing at the fringe, seems very modern. In fact, his “modern” error has deep roots. 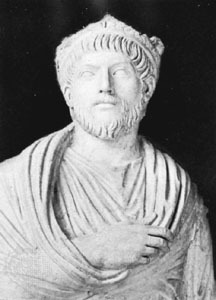 Julian’s program for returning Rome to paganism failed in part because he lived such a short time in power (361-63 A.D.), but also because he asks pagans to act like Christians in order to return to paganism. Julian, like Rome, was tragically confused. The religion of the Greeks does not yet prosper as I would wish, on account of those who profess it. But the gifts of the gods are great and splendid, better than any prayer or any hope . . . Indeed, a little while ago no one would have dared even to pray for a such change, and so complete a one in so short a space of time [i.e., the arrival of Julian himself, a reforming traditionalist, on the throne]. Why then do we think that this is sufficient and do not observe how the kindness of Christians to strangers, their care for the burial of their dead, and the sobriety of their lifestyle has done the most to advance their cause? Each of these things, I think, ought really to be practiced by us. It is not sufficient for you alone to practice them, but so must all the priests in Galatia [in modern Turkey] without exception. Either make these men good by shaming them, persuade them to become so or fire them . . . Secondly, exhort the priests neither to approach a theater nor to drink in a tavern, nor to profess any base or infamous trade. Honor those who obey and expel those who disobey. Erect many hostels, one in each city, in order that strangers may enjoy my kindness, not only those of our own faith but also of others whosoever is in want of money. I have just been devising a plan by which you will be able to get supplies. For I have ordered that every year throughout all Galatia 30,000 modii of grain and 60,000 pints of wine shall be provided. The fifth part of these I order to be expended on the poor who serve the priests, and the rest must be distributed from me to strangers and beggars. For it is disgraceful when no Jew is a beggar and the impious Galileans [the name given by Julian to Christians] support our poor in addition to their own; everyone is able to see that our coreligionists are in want of aid from us. Teach also those who profess the Greek religion to contribute to such services, and the villages of the Greek religion to offer the first-fruits to the gods. Accustom those of the Greek religion to such benevolence, teaching them that this has been our work from ancient times. Homer, at any rate, made Eumaeus say: “O Stranger, it is not lawful for me, even if one poorer than you should come, to dishonor a stranger. For all strangers and beggars are from Zeus. The gift is small, but it is precious.” [Julian is quoting from the Odyssey, 14-531.] Do not therefore let others outdo us in good deeds while we ourselves are disgraced by laziness; rather, let us not quite abandon our piety toward the gods . . . While proper behavior in accordance with the laws of the city will obviously be the concern of the governors of the cities, you for your part [as a priest] must take care to encourage people not to violate the laws of the gods since they are holy . . . Above all you must exercise philanthropy. From it result many other goods, and indeed that which is the greatest blessing of all, the goodwill of the gods . . .
We ought to share our goods with all men, but most of all with the respectable, the helpless, and the poor, so that they have at least the essentials of life. I claim, even though it may seem paradoxical, that it is a holy deed to share our clothes and food with the wicked: we give, not to their moral character but to their human character. Therefore I believe that even prisoners deserve the same kind of care. This type of kindness will not interfere with the process of justice, for among the many imprisoned and awaiting trial some will be found guilty, some innocent. It would be cruel indeed if out of consideration for the innocent we should not allow some pity for the guilty, or on account of the guilty we should behave without mercy and humanity to those who have done no wrong . . . How can the man who, while worshipping Zeus the God of Companions, sees his neighbors in need and does not give them a dime–how can he think he is worshipping Zeus properly? . . .
Priests ought to make a point of not doing impure or shameful deeds or saying words or hearing talk of this type. We must therefore get rid of all offensive jokes and licentious associations. What I mean is this: no priest is to read Archilochus or Hipponax or anyone else who writes poetry as they do. They should stay away from the same kind of stuff in Old Comedy. Philosophy alone is appropriate for us priests. Of the philosophers, however, only those who put the gods before them as guides of their intellectual life are acceptable, like Pythagoras, Plato, Aristotle, and the Stoics . . . only those who make people reverent . . . not the works of Pyrrho and Epicurus . . . We ought to pray often to the gods in private and in public, about three times a day, but if not that often, at least in the morning and at night. No priest is anywhere to attend shameful theatrical shows or to have one performed at his own house; it is in no way appropriate. Indeed, if it were possible to get rid of such shows altogether from the theater and restore the theaters, purified, to Dionysus as in the olden days, I would certainly have tried to bring this about. But since I thought that this was out of the question, and even if possible would for other reasons be inexpedient, I did not even try. But I do insist that priests stay away from the licentiousness of the theaters and leave them to the people. No priest is to enter a theater, have an actor or a chariot driver as a friend, or allow a dancer or mime into his house. I allow to attend the sacred games those who want to, that is, they may attend only those games from which women are forbidden to attend not only as participants but even as spectators. This week we very nearly wrapped up Assyrian civilization. In a fallen world, force can have a legitimate place in government. But both from a historical, moral, and political perspective, force can never be the foundation for order. Force can gain acceptance, or have legitimacy, if people see it as an extension of justice. But when a power uses force detached from justice, people sense that they use violence merely to serve their own selfish ends. This inspires them to seek justice/revenge, and this is why violence apart from justice is a wasting asset. All of the problems Assyria faced they brought upon themselves. They treated subject populations brutally out of a combination of a) religious belief, and b) policy that sought the quickest route towards “getting everyone in line” with their conquests. But as their power grew, the attention they could give to subject territories lessened, which reduced their chances of stopping rebellions. The loss and misery which Assyria inflicted on her neighbors is beyond calculation, and yet the legendary remark of the schoolmaster to the boy he is whipping–‘It hurts you less than it hurts me,’–would be a pertinent critique of Assyrian military activities. . . . The full and bombastic Assyrian record of victories abroad is significantly supplemented by rarer and briefer notices of troubles at home that give us an inkling of the price at which Assyrian victories were purchased. An increasing military strain revenged itself with increasing frequency of palace revolutions and peasant revolts. As early as the close of the second bout of aggression in the ninth century B.C. we find Shalmaneser III dying in 827 B.C. with his son on the war-path against him, and Ninevah, Asshur, and Arbela in rebellion. . .
After this the two streams of domestic stasis and foreign warfare merge into one; after Ashurbanipal’s death this swells into a mighty river whose rushing waters bear Assyria away to her now inevitable doom. During the last years of Assyrian history the domestic and foreign aspect of Assyria’s disintegration are hardly distinguishable. Can a civilization be rooted entirely in a frontier mentality and lifestyle? Assyria was located on the ‘frontier’ of Mesopotamian civilization. Like many frontier people, they could be inventive and self-reliant. But their beliefs, their foreign policy led them to conquest ‘a outrance’ as the French say. Assyria’s attacks against Babylon come with an animosity that a farmer in West Virginia might feel for Manhattan investment bankers. But frontiers need a home base, and with this attack, Assyria was cutting off its face to spite its nose. The arm which held the sword stabbed the heart. Without Babylon, Assyria suffered much in the same way that the West Virginia farmer would suffer. Without the banks, where would be the corporations to buy the food they grew? If they always looked outward, could they build a solid cultural foundation on which to rest? While some aspects of Assyria’s cultural heritage can be disputed, no one would doubt that in comparison to Egypt, Babylon, and Persia, Assyria’s cultural output was quite low. Their architecture, art, and literature all were inferior to their neighbors. One sees a complete lack of self-awareness on Assyria’s part. It’s as if they erased their conscience through centuries of systematic cruelty. They reveled in their conquests and never questioned their actions, celebrating them in their meager artistic achievements. Next week I will update you on our investigation of Babylon. The evaluations of the historically minded often move like a pendulum. I see this throughout my own life. Initially, like everyone, I thought Napoleon a great genius. But then you think again . . . after all, he lost. And what about what happened in Egypt, to say nothing of Russia? And what of all those armies he beat from 1799-1809–nothing more than decrepit, out-dated Enlightenment entities destined for the trash-heap anyway. After a while, however, I thought again and gave credit where due. Sure, his armies were the perfect foil for the Austrians and Prussians, but he helped create the French army that formed that perfect foil. Like any great leader he imprinted himself all over his army. And we say that the armies he faced were bound for trash-heap only with the benefit of hindsight. Napoleon put them there, after all. But . . . he lost. Writing about The Civil War comes with similar pitfalls. As the states began to come together in the Progressive Era (ca. 1880-1920) we looked for unity and healing from our past, and we lionized Lee as a romantically doomed warrior, who nevertheless, performed heroic feats. Lee’s generalship for that era stood second to none. Beginning in the 1960’s historians swung the narrative. They focused on Lee’s irascible temper, his huge losses, his weak opponents, his strategic failures at Antietam, Gettysburg, and so on. Joseph Glatthar’s excellent General Lee’s Army brings balance back to this narrative. He studies the army of Northern Virginia in depth and concludes that of course, Lee was a great commander. He helped forge a great army with a great record in the field. He deserves much of the credit he receives. But . . . he lost, and we do well to remember this. Glathaar shows us how the strengths and weaknesses of Lee and his army come from the same place by looking at culture, demographics, the life of the common solider, and those directly under Lee’s command. We do have to take into account Lee’s frequent opponent, the Union’s Army of the Potomac. From a pure match-up standpoint, it would have been interesting to have Lee, Longstreet, and Jackson oppose Grant, Sherman, and Thomas for the duration of the conflict. As it happened Lee only faced Grant towards the end of the war, and then Grant had to work with the Army of the Potomac, where he inherited a completely different, and vastly inferior, operational and command culture than he worked with out west. In A Savage War, the authors point out that the Army of the Potomac inherited a disproportionate number of soldiers recently graduated from West Point. A West Point education tended at that time to over-emphasize math, engineering, and organization (something that U.S. Grant lamented in his memoirs). Such skills have their place, but should not have pride of place in officer training. Those that drank from the firehose of this approach would inevitably give way to excessive caution. Meticulous organization takes a lot of time. In addition, once you have built something so “pure” and pretty, one might not wish to do anything that might get it dirty. This helps explain why McClellan (tops in his class at West Point) could think himself a great general even though he couldn’t actually win a battle. He was excellent in doing what his education, at least in the narrow sense, trained him to do. The plodding, rigidly organized Army of the Potomac gave Lee and his men a perfect target given their particular strengths. Glaathar points out that the men in Lee’s army fully believed in their cause and came with the strongest of motivations. Ante-bellum southern society had the duel influences of the aristocratic planter and the Appalachian border-settlers. Both of these cultures emphasized honor and courage. Both of these cultures preached a vision of manliness that gave way to no one. Letters home from top officers on down the ranks show a constant desire for combat and to prove themselves. Lee both understood and embodied this himself. Many other accounts of his generalship focus on his ability to psychologically assess his opposite number on the Union side and devise the proper approach accordingly. Glaathar adds to this, showing how Lee knew how to use his men expertly. They proved superlative in the counter-attack, and could march quickly and fight hard back-to-back. We see this at Bull Run, in Jackson’s Shenandoah campaign, and at Chancellorsville, as at other times. But both the aristocratic planter and border settler culture had its weaknesses, and these too had a significant impact on the war. Appalachian border culture emphasized freedom of initiative and eschewed “systems” like tight and itchy collars. Lack of formal structure gives one great freedom. But an army of tens of thousands needs tight organization to act as a unit. Without this organization, large scale offensives could never be undertaken. The aristocratic nature of the army came through in the upper echelon of the officers. The bickered for position and rank. At times they disobeyed directly if they felt insulted. Some at times seemed to prefer maintaining their honor to winning a battle. All of these weaknesses would make coordinated action over a large distance difficult. Perhaps this is why Lee spread out his armies in his invasion of the north in 1863. It gave each commander more independence. But . . . when the time came for coordinated action, invariably Lee’s forces could not pull it off. In aristocracies the military profession, being a privileged career, is held in honor even in time of peace. Men of great talents, great attainments, and great ambition embrace it; the army is in all respects on a level with the nation, and frequently above it. We have seen, on the contrary, that among a democratic people the choicer minds of the nation are gradually drawn away from the military profession, to seek by other paths distinction, power, and especially wealth. After a long peace, and in democratic times the periods of peace are long, the army is always inferior to the country itself. In this state it is called into active service, and until war has altered it, there is danger for the country as well as for the army. It may be remarked with surprise that in a democratic army after a long peace all the soldiers are mere boys, and all the superior officers in declining years, so that the former are wanting in experience, the latter in vigor. This is a leading cause of defeat, for the first condition of successful generalship is youth. I should not have ventured to say so if the greatest captain of modern times had not made the observation. A long war produces upon a democratic army the same effects that a revolution produces upon a people; it breaks through regulations and allows extraordinary men to rise above the common level. Those officers whose bodies and minds have grown old in peace are removed or superannuated, or they die. In their stead a host of young men is pressing on, whose frames are already hardened, whose desires are extended and inflamed by active service. They are bent on advancement at all hazards, and perpetual advancement; they are followed by others with the same passions and desires, and after these are others, yet unlimited by aught but the size of the army. The principle of equality opens the door of ambition to all, and death provides chances for ambition. Death is constantly thinning the ranks, making vacancies, closing and opening the career of arms.
. . . An aristocratic nation that in a contest with a democratic people does not succeed in ruining the latter at the outset of the war always runs a great risk of being conquered by it. *Interesting parallels exist between Lee and Napoleon’s armies. Both faced stiff, rigidly organized opponents. Both emphasized movement, speed, and capitalized on the energy and spirit of their men. Both had great success early, but both also suffered significant setbacks as their respective wars dragged on. Each faced manpower issues, but also, their opponents got better over time and neither Napoleon or Lee made the necessary adjustments based on the improvement in their opponents. In fairness to the Army of the Potomac, the soldiers displayed extreme courage at Fredericksburg, and were stalwart in the defense at Gettysburg. **Many southerners decry the actions of Sherman. Glaathar demonstrates that Lee’s army did many of the same things, albeit on a smaller, less organized scale, as Sherman’s army. And . . . they did this not just in Pennsylvania but in Virginia as well. ^Fredericksburg might serve as a good example of these qualities, with a negative outcome. The author knows he is writing about something arcane and of little general interest. He does little to spruce up the writing — he at times seems to wallow in the details, perhaps getting a secret laugh out of boring his readers. My eyes glazed over more than once. The book is thorough, but still brief enough for someone with just enough interest to glean some tidbits. I am far, far from having any comprehensive knowledge about Rome, but I wanted to read this to test a theory. Gibbon puts the fall of Rome essentially beginning after Marcus Aurelius. Others, like Toynbee put it far earlier. I tend to see it happening sometime after the 2nd and before the 3rd Punic War, and I wanted to see what Cheesman analysis of the Roman army had to contribute to this debate. Early on Cheesman makes some interesting observations, namely that the imperial army was more versatile and specialized than any army of the Republic. This probably has do with the fact that they encountered different cultures and fighting styles as they expanded. They added cavalry (one may recall the serious weakness of the Roman cavalry when they faced Hannibal), usually getting them from far flung conquered provinces. But no one would think that the Imperial armies were superior to say, those under Scipio Africanus ca. 210 BC. In other words, increasing complexity and specialization may not have been a sign of strength, but subtle weakness. The increased specialization shows they had too many burdens in too many places around the globe to maintain a coherent fighting force with a fixed identity. 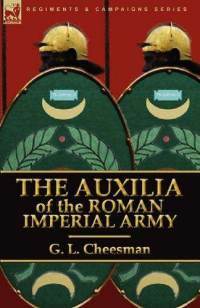 Also, Cheesman points out that many of the recruited ‘auxilia’ (auxiliary troops attached to the legions, recruited from conquered provinces) often rebelled against their new masters when stationed near their home territory. This could be fixed by shipping them elsewhere, but this created awkward burdens and costs involving transport. Surely it also lessened the effectiveness of these auxiliaries, as they had to fight far from familiar territory. The fact that Rome faced so many rebellions within its ranks tells me that Rome lost its mojo long before Marcus Aurelius, contra Gibbon. These rebellions came despite the fact that some emperors fast-tracked the path to rights and citizenship for many auxiliary regiments. They were being more ‘progressive’ in a sense, but it made no difference — things were not working as they used to for Rome. One need only recall the general solidity of their alliance system during the much greater stress of the 2nd Punic War to see this happening. With more knowledge of Imperial Rome, more patience, and more military background I might have gleaned more from this work. Still, one always likes their theories backed by neutral observers! So, my gratitude to G.L. Cheesman for his somewhat tedious, partially sleep inducing, yet still occasionally quite insightful book. 8th Grade: He Who Lives by the Sword. . . This week we looked at Assyrian civilization. Their meteoric rise was surpassed only by their complete and total destruction at the hands of several enemies. What made them who they were? We first looked at their geography. . .
1. Assyria began in the north of the Fertile Crescent, in one of its less fertile areas, nestled in the Zagreb mountains. We discussed how people who live in mountainous regions tend to display similar characteristics. Necessity might force them to rely on hunting. They grow to be tough and adaptive, and generally warlike, with built in mistrust of foreigners due to their relative isolation (think Afghanistan). Assyrians had similar characteristics. 2. Their geography may have lent impetus to their expansionist desires. These tough, warlike people were generally surrounded by more wealthy civilizations that might have been a bit ‘softer’ than the Assyrians. Nomadic civilizations (those that have to/choose to follow ‘the herd’) can never be as wealthy as more agrarian civilizations, for they can never stay in one place long enough to produce anything. Perhaps they could not resist all they saw around them. Perhaps after a while, jealousy and envy took hold. Then we looked at their army . . .
1. Mountainous regions generally are not as populous as other places, but the Assyrians managed to create a brilliant militia force. Without the mass of other armies (nomadic hunting oriented civilizations inevitably have smaller populations) they had to rely on speed and movement. But their citizens, used to hunting, would have been used to moving, tracking, and outwitting their prey. In class I compared their army to the new ‘Blur Offense’ in football popularized by the University of Oregon. Usually did not emphasize diplomacy. They could not integrate their conquered foes into their army (think about how the effectiveness of a Navy Seal platoon would be diminished by adding army regulars into their ranks). So – how do you hold onto your territory? The Assyrian army was not generally interested in occupation. They wanted movement. If ‘you are what you worship,’ we would expect the Assyrians to use terror as a weapon, and so they did. My guess is that the students will remember the various forms of torture and death the Assyrians inflicted if you are curious enough to ask them. With the conquered cowed into submission the Assyrians could move on. We looked at Paul Kennedy’s concept of ‘Imperial Overstretch,’ when size becomes a disadvantage as opposed to an advantage. Clearly the Assyrians suffered from this, for as we discussed, fear is a wasting asset. It tends to be a very effective short term, but disastrous long term policy. Some of you may remember the boxer Mike Tyson, and I think he is a good representation of the Assyrian army. Tyson was almost always the smaller man in the ring, outweighed and outreached by his opponent. But his lightning speed confused his opponent, and he hit with such devastating force that he surely “ruled by fear” over his foes. The students had fun with excerpts from these clips in class. Then we looked at their religion. . . The Assyrians were polytheistic, but tended to emphasize the worship of their war god Ashur. 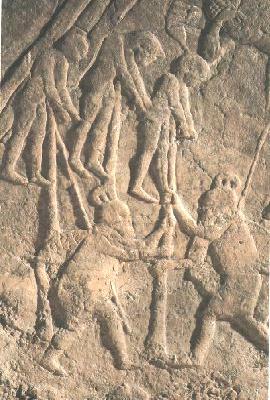 Ashur demanded blood, as the Assyrians obliged, presenting large amounts of the severed heads of their enemies at worship services. 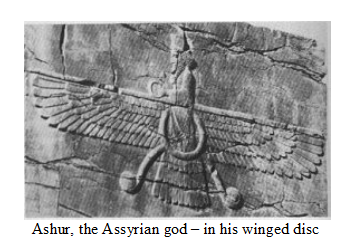 Interestingly, apparently the most common way of representing Ashur was on his winged disc, which hearkens back to the dominance of movement in Assyrian civilization. This week we continued with Rome’s decline and saw the rise of Constantine, and with it a significant change in the history of the west. 1. Rome was too big to control himself. He divided up the empire into administrative regions and delegated much of his power, which was quite unusual for a Roman emperor. 2. Rome’s problems went far beyond the military. They had a ‘spiritual’ or ‘moral’ problem at heart. 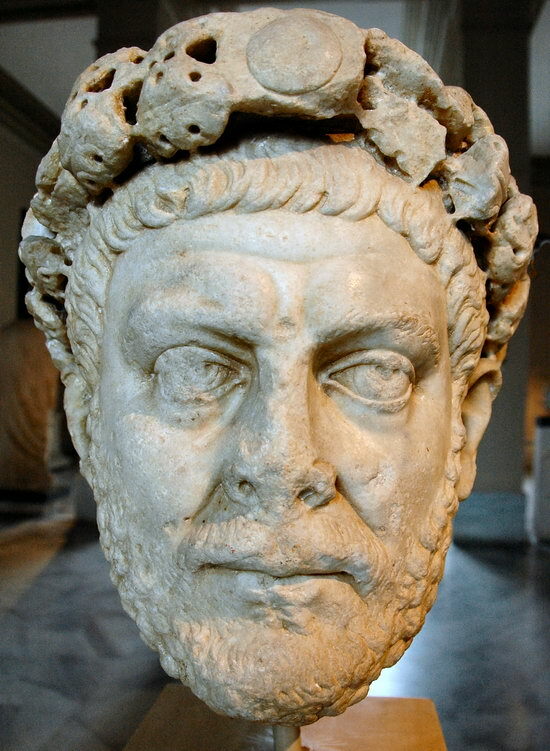 Diocletian sought to revive Roman values, tradition, and religion. 1. Can you ‘go home again’? Can you use force to create things like patriotism, or belief in general, for that matter? 2. Was Christianity a threat to Rome? In one sense the answer is of course, ‘no.’ In general Christians were good citizens who could have breathed new spiritual life into Rome. But in another sense, Diocletian shows his insight by recognizing that Christians were indeed a threat to Rome’s values of strength, pride, and power. Christianity baffled Rome by preaching weakness and humility. His persecution of Christians was Rome’s last and most intense. It’s failure only helped contribute to the ‘triumph’ of the Church. I mentioned in class that I feel bad for Diocletian. Far from being mad with power, he actually sought to divest himself of power to make Rome more secure. He saw the various political and economic problems Rome faced and realized that their real problems lie deeper — in culture and morality. He had some keen insights, but came to disastrous conclusions from those insights. Still, Diocletian’s persecution of Christians only continued Rome’s blindness. They failed to see their own selves as the problem. Typically, they projected their problems onto others. As many historians have noted, Rome’s own decadence, decline, and violence helped create a spiritual vacuum that Christianity filled. 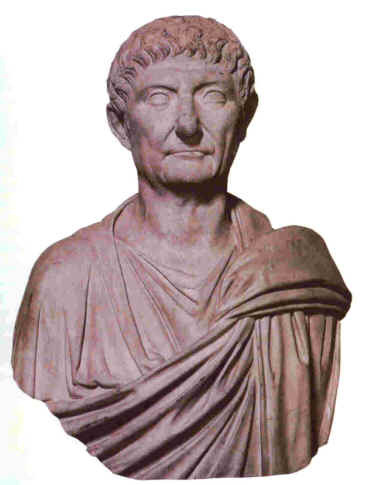 Not surprisingly, Diocletian’s passion for re-ordering Rome through direct control spilled over into his desire to control Rome’s economy and manage prices throughout the empire. Price-controls in any circumstance almost always have negative effects. Price-controls across an expanse as vast and diverse as the Roman empire would without question bring disaster. 1. Would Constantine’s support of the Church be good for society? Would it be good for the Church? If we arrive at different answers for those questions, should we favor the Church or society? 2. Constantine claimed to be a Christian, but as emperor he had many official duties related to the old Roman religion. Can a leader have ‘two bodies,’ one public and the other private? If he represents more than just himself, might he have duties that put him in conflict with his private convictions? What should leaders do in these situations? Does Constantine’s dual roles put his ‘conversion’ into doubt? Next week I want to show the students another kind of archeological evidence. 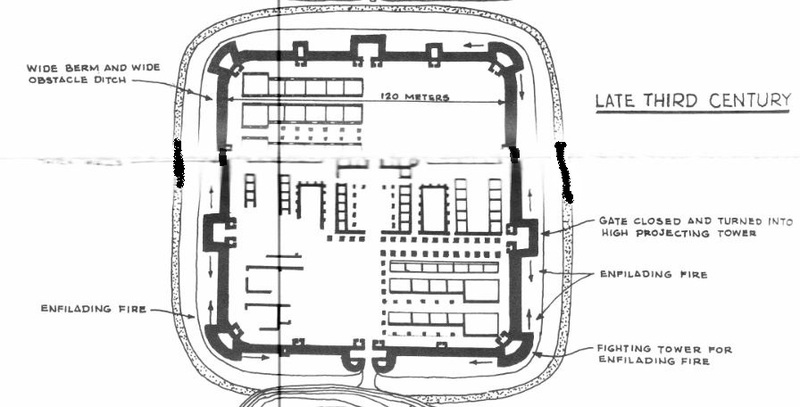 Roman fort design changed over the centuries, and these changes tell a story. The relatively little effort put towards defense shows the openness and confidence of not just the army itself, but the army’s sense of security in occupied territory. Rome may very well have expected a good relationship in its provinces. The nature of Rome’s army, and the nature of its relationship to the world outside Rome, had changed dramatically.